When an Adobe solution is at the heart of your business, the ability to maximize your investment depends on how effectively you can put the technology to work. 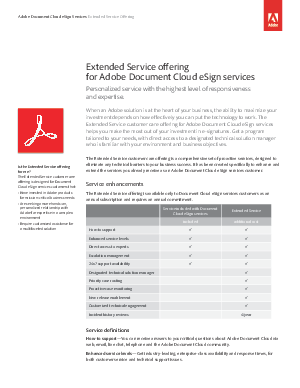 The Extended Service customer care offering for Adobe Document Cloud eSign services helps you make the most out of your investment in e-signatures. This white paper provides information on the Adobe Extended Service customer care offering and the advantages of using it for achieving business success. Download now to learn more about the Extended Service offering.